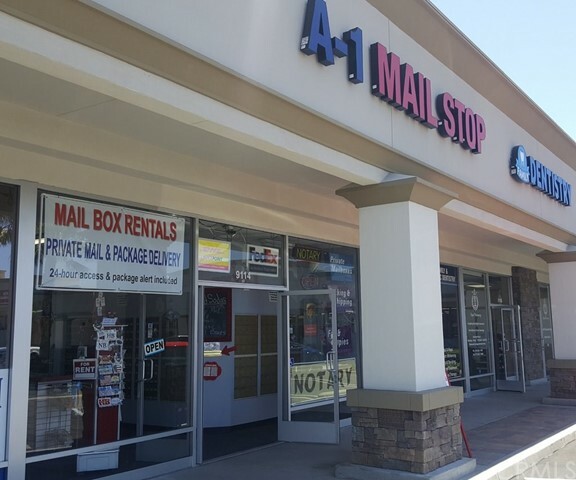 "A-1 Mail Stop" is a well-established Private Mail Box rental store with 336 total mailboxes (32 lg, 64 med, 240 sm), 24-hour access, NON-FRANCHISED Authorized Shipping for U.P.S., FedEx, D.H.L., and U.S.P.S.. In addition to mailboxes and shipping, the store offers NOTARY and PACKING and FINGERPRINT services. There is AMPLE RETAIL SPACE selling shipping/office supplies, gifts, novelties, crafts, holiday specific items, gift cards, post cards, recycled boxes. The store has been an authorized drop-off location for both U.P.S. and FedEx for many years. Located in a high income area of South Huntington Beach on a MAJOR INTERSECTION with ANCHOR TENANTS: SMART & FINAL and CARL'S JR.. There is a high traffic count and high medium dollar income for this location!!! This store has extremely good GOODWILL and GROWTH POTENTIAL for this price!!!!!!! Price Includes FFE & Inventory & Training.